Home / I love makeup / Makeup / Makeup tag / Tag / I Love Makeup Tag!!!! Hey my makeup geeks!! I really wanted to do this post since SO long as I've been reading about Makeup Tag posts and have been watching video's since so long and it hit blogsphere like storm. It's not so hard if you don't have a lot of makeup or you just don't want to spend a lot of time doing your makeup but still want to look nice, polished and presentable. This is an authentic makeup tag like What's In My Bag tag, but since nobody tagged me so I'm going to do it by myself as this makeup tag is so indecisive when it comes about beauty/makeup or anything like that as for me that would be a fun thing to do. - How many times do you was your face daily? Thrice a day and/or whenever remove makeup. I have sensitive oily skin prone to acne. Clean and Clear Detoxyfying Facial Cleanser and Ponds Pure White Deep Cleansing Facial Foam. Yes, twice or thrice weekly. -What brand you use for exfoliation? Anatomicals Day Cream Believer Facial Moisturizer. -Do you have wrinkles or freckles? -Do you use eye creams? I have one though from Olay, but I'm too lazy to use it. -How old were you when you started wearing makeup? I suppose if I'm not wrong at the age of 17. Even though that was just a gloss and mascara. -What are your favorite brands? For high end brands, they are MAC, Illamasqua, Sigma, Sugar Pill, Ellis Faas and Mikyajy and for drug store brands I love Revlon, Maybelline, Rimmel, Luscious, Color Studio Pro and NYX. -What are the brands you want to try the most? There are some indian brands I'd love to try them out like Lakme, Elle 18 and Lotus Herbal. Other then that would love to try Diana of London, NARS, DMGM and Art Deco. -How did you get into makeup? All thanks to Youtube I must say. -What does word 'Makeup' mean to you? For me, it's the eternal love of my life as I see it as a canvas that I can paint, create, re-create and enhances the features and looks. - If you could wear only 5 products to wear on face what would they be? For me, it's going to me a concealer, compact powder, eye liner, blush and lipstick. -What do you think about drug store V/S high end? For me seriously I love both. Sometimes you get better quality in drug store brands that you failed to find in high end brands but seriously it depends. -What makeup trend you hate the most? Well to be honest, I never get the concept of dark lip liner with a light shade of lipstick? -Do you prefer quality or quantity? Well I'm kind of a person who believes in Quality rather then quantity. You buy less but buy a quality item rather then buying low quality stuff in a large quantity and sadly I have been noticing girls are getting crazy for Quantity rather then Quality. -What a beauty means to you? -What is one advice you would like to give to a beginner? PLEASE never go a quantity and go for less but a quality product and do your research before spending your hard earned money and built your collection slowly. Take your time, do research and be sure that the product you are buying, you actually WANT it or not. 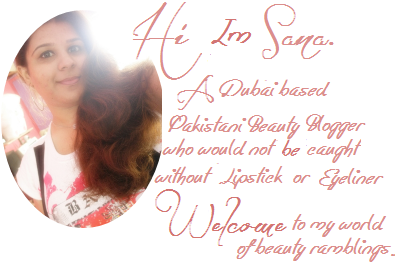 -What is a beauty blogging mean to you? To me, my blog is my baby and I love it like a baby. I've learnt so much through it and through a Youtube beauty community and met some really great people who are a good friends now. I believe I'm just a toddler in this community and there are FAR more better bloggers then me who are doing an awesome job managing this beauty community so well. 24 comments on "I Love Makeup Tag!!!!" Great post ... I must say, Stives brand has high end great products .. I like it - Such a fun exercise! I love this tag, thanks for sharing! This is great, thanks for posting. Lovin this post…. Found you on GIG. Showin some love! I love beauty tags like this, it tells you more about the blogger and it's always nice to know who's behind an awesome blog. Thanks for sharing hun. aww lovely tag, love what make up means to you, so cute! I love reading makeup tags! my favorite answer, was A GIFT FROM GOD.